Don has been farming on the the Western Slope for 15 years. Growing a wide diversity of certified organic flowers and vegetables his passions have led to growing seed. Don is interested in sharing seed growing as a way to have a deeper relationship with what you grow, but also as a potential for farmers to have a new niche in the region. The Western Slope is a great place to grow seed and the need to have more regionally adapted seed is paramount. 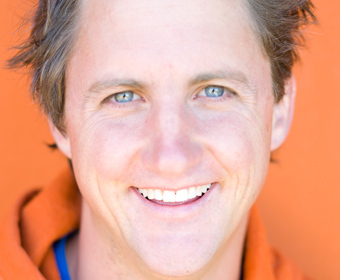 Frank Stonaker has a diverse background – grounded in organic production. He got book-schooled as needed (BS in Agronomy, MS in Entomology, PhD in Horticulture), but learned most of what he knows from his time farming, greenhousing, orcharding and listening to his colleagues – which he has done for close to 40 years. Along the path he’s had the good fortune to work as a biocontrol and pollination consultant, do applied research in organic vegetable production, and teach. And help raise a couple of fabulous kids. Now he and his wife Beth own an organic orchard on Rogers Mesa. Frank manages CSU’s Western Colorado Research Station at Rogers Mesa – where the new focus of research is – you guessed it – organic production systems! Lyn Howe, (BS Biology U of Wisconsin, MS, PhD U of Minn.) has a been an avid seed saver, farmer, gardener and artist for over 40 years. Since 2011 as Director of the Hawaii Public Seed Initiative, (a program of The Kohala Center, Waimea, Hawaii), Lyn has directed seed education across the Hawaiian islands. Collaborating with UH College of Tropical Agriculture extension agents, together they promoted the importance of growing and saving seeds adapted to low input eco-agricultural systems, selecting for varieties best adapted to thrive in diverse microclimates and to best withstand tropical diseases and pest pressures. Since 2015 Lyn worked to identify and train statewide seed growers to create the Hawaii Seed Growers Network and offer Hawaiiʻs small farmers and gardeners quality, locally adapted seed (available online). This network has recently begun breeding new and unique adapted varieties. 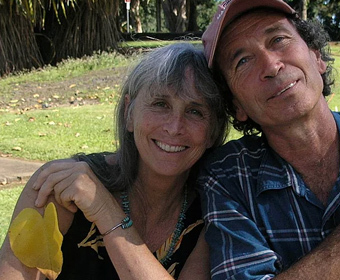 Lyn and her husband Geoff lived and farmed organically on Hawaii Island for 15 years, since 2018 they reside in Paonia, CO.
Mark Waltermire, of Thistle Whistle Farm in Hotchkiss, has been growing distinctive vegetables and varieties for over 25 years. He has farmed in Pakistan, California, Montana and Massachusetts, and is in his fifteenth season at Thistle Whistle Farm. His interests include hot peppers, sweet peppers, and tomatoes, and he grows in the neighborhood of 250 varieties of these fruits every year. He saves seed with local first-grade classes and welcomes school field trips to his farm to involve kids in the wonder and beauty of food production. 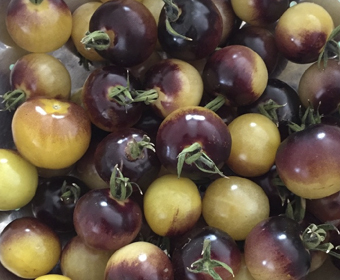 Casey Piscura is a Plant Breeder and Owner of Wild Mountain Seeds where he and his partner farm for market and seed in their Zone 3 climate outside of Carbondale, CO.
Casey specializes in open pollinated breeding of various crops most notably tomatoes. 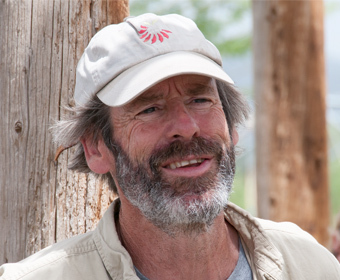 He uses both traditional and non-traditional breeding techniques, using diversity, de-hybridization and land racing to help him better adapt plants to the challenges of growing in his mountain climate. 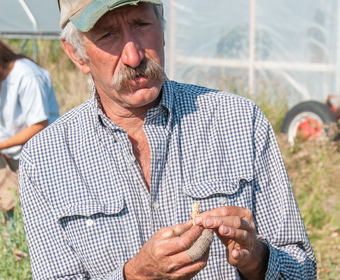 Pat Frazier has been a Biodynamic farmer for over 20 years. She and her family have a small biodynamic homestead, diversified farm, and family dairy in Western Colorado where all of the preparation herbs are grown and utilized in making the indigenous Biodynamic preparations for her farm organism and Western Colorado Regional Biodynamic Group. Permaculture design is another of her passions and its marriage with Biodynamics is included in her two-week residential permaculture certification in the summers. 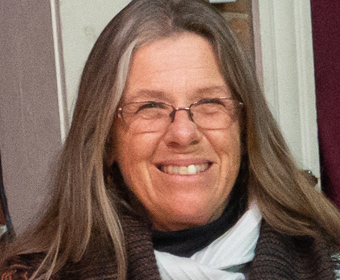 Pat is a passionate cultivator of the Biodynamic Agriculture movement, speaking nationally and regionally at major Biodynamic conferences and advising on three national organizations. She is the president of the board of directors of Josephine Porter Institute for Applied Biodynamics, Inc, the largest non-profit distributor of the Biodynamic Preparations in North America. Sarah is passionate about seed saving and providing resources for others to share in this time honored tradition. She has worked with local farmers, interned with Strictly Medicinal Seeds, and saved seeds from her garden for the last ten years. 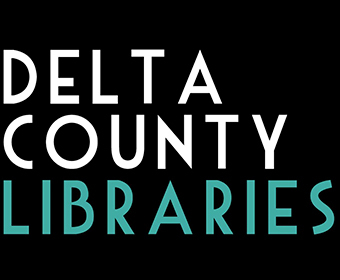 In 2014 she helped start the Delta County Seed Library, a library of seeds available to Delta County residents. Sarah oversees the Seed Library and loves engaging with seed savers in her community and beyond. Greg grew up on a 130 acre organic farm on the Arkansas River – one of the first in La Junta, Colorado. His family of eleven – his parents, five brothers, three sisters, and he – worked together to grow grains, vegetables, and alfalfa hay on the Arkansas River during the fifties, sixties, and seventies. 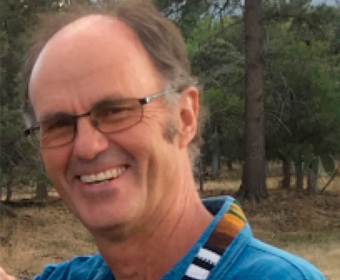 Greg moved to the North Fork Valley in 1979, and then in 1981 began living and teaching gardening and gymnastics at the Lamborn Valley School (then a Waldorf school). In 1987 the vision of having a farm school came true when he purchased the 130 acre farm on the North Fork of the Gunnison River surrounding the school (similar to his father’s vision). 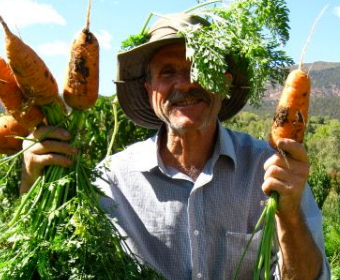 His children grew up learning how to garden and farm as well as take care of farm animals. We also taught the students at the school how to grow, harvest, preserve, and cook their own food. One of their sons got inspired to plant 1,400 fruit trees – various varieties of peaches, cherries, nectarines, plums, apples, pears, and almonds. They also grow grains, seeds, vegetables, and hay for the livestock. His greatest inspiration now is learning and living an agricultural lifestyle that shares the gospel message of love. 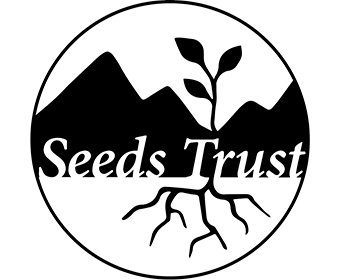 Julia Coffey and Alisha Wenger are co-owners of Seeds Trust, a bio-regional seed company specializing in high-altitude adapted and open pollinated vegetable, herb, wildflower and native grass seeds. Julia is from Littleton, Colorado and received her degree in linguistics from Colorado State University before meeting and apprenticing with Bill McDorman, founder of Seeds Trust. After helping Bill run the business, Julia bought the company and has been running it for the past seven years. Alisha is also from Colorado and has worked as a grant writer in the nonprofit and government sectors since coming home from the Peace Corps in 2013. She also has her permaculture design certificate and is board treasurer for Global Seed Savers. Laura is owner and operator at High Desert Seed and Gardens a seed company in Montrose, CO that focuses on varieties attuned to the unique conditions of high altitude and desert regions. She has been involved in seed work since a child starting out in her parents organic garden on their holistically managed ranch. After receiving a degree in biology and working on farms throughout college, she became the executive director of the Organic Seed Grower and Trade Association. She also worked with activist and fellow seed saver Vandana Shiva at her seed bank in India. 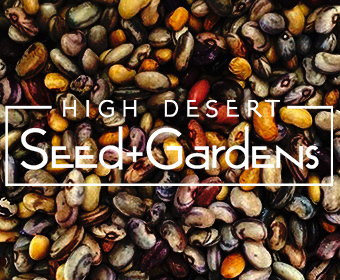 From these influences she decided to start High Desert Seed in 2015 to continue to protect biodiversity and support small scale ecological farming systems in the Southwest area. We are J & Farm Co. located south of Crawford. We grow garlic and heirloom grains and are certified naturally grown. We have been growing grains for 6 years. We have tried growing dryland and under irrigation. Some of the rare varieties began from 20 or 50 seeds sourced from the Grain Restoration Project. We now have enough seed to plant acres per variety. In 2018 I had 14 acres under cultivation. A focus now for us is learning what the market wants us to grow. I use a 1940’s steel wheeled seed drill, a 1967 Gleaner A2 combine and a 1961 Clipper seed cleaner. I have always thought that grains can be and should be a part of gardening, homesteading and the folks producing their own food.